Larger picture. This is a 4.5 Mb file Adobe Acrobat file. You may need to the back button on your browser to return to this page. EVERYONE Charlie Manuel runs into these days has an opinion on what he should do with his batting order. He could be out having dinner, and someone will come up to him and say, "Charlie, if I were you... " Invariably, the suggestion is to insert Bobby Abreu into the leadoff spot and drop Jimmy Rollins down in the order. The consensus seems to be that if he simply does that, you can begin printing those World Series tickets. 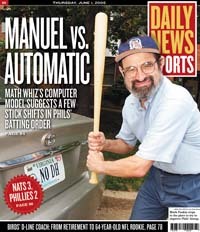 In the spirit of lending Charlie even more of a helping hand, the Daily News contacted Mark Pankin, a mathematics wizard from Virginia who has developed one of the more sophisticated computer models to analyze the productivity of baseball lineups. Inputting the career statistics of the eight regulars through May 21, Pankin assessed the run-scoring ability of a lineup typically used by Manuel and then attempted to come up with one that would be even better. Interestingly, the average run totals produced by both were very close. In fact, they were so close that the computer-preferred lineup accounted for just 6.48 extra runs per season against righthanded pitchers and 7.45 against lefthanders. In that Pankin says "a general and usually good rule of thumb" is that 10 extra runs should translate into one more win during the course of a season, one could extrapolate that the highest-scoring lineup Pankin could come up with would account for perhaps one extra win over 162 games. Bear in mind that this is purely theoretical. The model Pankin employed does not consider certain variables that would typically come up during the course of a game. Pankin says it does not factor in pitching changes or the use of pinch-hitters or that other players will be in the lineup due to injuries or days off. But it does evaluate the potency of one starting lineup over another. And in the case of the Phillies, it echoed what some of the fans have been yelling for years. Bat Abreu in the leadoff spot! Surprisingly, it also switched Pat Burrell from the cleanup position into the second hole. And it would drop Chase Utley from second to eighth in the order against lefthanders. Overall, Pankin says the model likes what Manuel is doing, but adds that it thinks Manuel "could do a little better if he leads off with Abreu rather than Rollins." Insofar as Burrell is concerned, Pankin understands that Manuel would probably have trouble implementing that move in the real world, if only because conventional wisdom says "certain types of hitters should hit in certain places." "Burrell has a lot of power, so we think of him as someone who should be hitting fourth or third," says Pankin, who received his doctorate in mathematics from the University of Illinois-Chicago. "But Burrell has a very high on-base percentage, which is why the model wanted him higher in the order. If you can prolong innings, you can increase your chance of scoring. So you want players who get on base at the top of the lineup." "Because if you go down and look at their on-base percentages against lefties, Utley is as poor as any of them," says Pankin, who is an investment adviser in Arlington, Va. "He is 15-for-56 and only has two extra-base hits, both of them doubles. No triples or home runs. But he does seem to draw some walks." But relying on cold statistics alone is not the way to go, as Manuel himself says as he sits in his office Sunday morning before the Milwaukee game. Given a copy of the computer findings, Manuel looks over it carefully, glances up and says: "Interesting. The numbers play a part [in coming up with the lineup], but only a part. What you have to do is take into account the ability a player has." That is why even if Einstein himself appeared as an apparition and told him to do it, Manuel would not bat Abreu in the leadoff spot. Even when Rollins is struggling, Manuel says he loves "the electricity" that the switch-hitting shortstop can create. While Rollins does not have the on-base percentage of Abreu, Manuel says he is "our only legitimate basestealer," one he says could swipe between 50 and 75 bases in a year. And he likes coupling him at the top of the order with Utley, who also has a fine on-base percentage and, as a lefthanded hitter, is capable of pulling the ball into the hole between first and second. Says Manuel: "It gives us the opportunity to play situation baseball if Jimmy can get on." Going down the lineup, Manuel then came to the heart of the order: Abreu, Burrell and Ryan Howard. He likes batting Abreu in the three hole because, while he has an exceptional on-base percentage, he has proved he can drive in runs. Working on the assumption that one or possibly two of the top three batters gets on, Manuel says he then has some "good runners" on the bases for the power-hitting Burrell, which he says helps to prevent the bases from becoming clogged. And Burrell has a very high on-base percentage (.361 career, .408 this season), which Manuel says sets up the lineup perfectly for the long ball-hitting Howard. "Some people ask, 'Why not bat Howard fourth?' " Manuel says. "I bat Pat there because it splits up our lefties. Because if I hit Howard fourth, the likelihood is that later in the game, [the other team] would bring in a lefthanded pitcher to face our lefthanded hitters." That happened yesterday in the eighth inning: The Nationals brought in a lefthander, Mike Stanton, who struck out Utley, Abreu and Howard. Ideally, what Manuel says he is searching for is "balance" in the lineup. Because of that, he likes batting Aaron Rowand behind Howard. Rowand is a righthanded hitter with the capability of batting .300, with an on-base percentage of .345 and up. Manuel says Rowand also is a better-than-average runner. He likes having him bat ahead of David Bell, who Manuel says has some occasional power and handles the bat well. "So with Rowand and Bell up, we can do some things," Manuel says. "[Rowand] can steal a base or we can hit-and-run." Manuel then has a proven hitter in Mike Lieberthal in the eighth spot. Manuel says he is always scribbling out alternative lineups, especially if he plans to work in some bench players on a given day. He had hoped to do that Sunday, but the team had been losing so he stayed with his usual lineup. When he does juggle it, he says he looks at a variety of statistical information, which he keeps in a closet above his desk; he says he has done that for years. He also consults with his coaches for their opinion if a player happens to be going poorly. But he emphasizes that he does not take into consideration the opinion of fans or others. "For someone to voice an opinion on where somebody should hit in the lineup, I think there is nothing wrong with that," Manuel says. "But when people come up and say, 'Hit Abreu first or Howard fourth' or whatever, they feel like they have to tell me something. Like, 'You don't know.' Well, I think I do know. And when the point comes when I do not know, someone else will be sitting in this chair." From that vantage point, Manuel says some of it simply has to do with intuition, of weighing an accumulation of observations into the equation. In the case of Utley and Howard, he has two dynamic young players who have yet to reveal a form over an extended period. Overall, he tends not to look at pitcher-batter splits until the batter has 50 or so at-bats against a pitcher. That said, he adds quickly: "If I look there and see a hitter who has 20 at-bats on somebody and he has 12, 14 strikeouts, I pay attention." Coming up with a lineup everyone likes that is productive has never been harder, especially when there are fans out there with statistical data and computer models. And then you have the players themselves - the superstars - who settle into a spot in the lineup early in their careers and can be hard to move. Somehow it seemed simpler back in the old days, when Manuel was playing with the Twins. He played for Billy Martin, who every so often did what every manager is sometimes tempted to do with his lineup: He picked it out of a hat. Part 2: Philly manager Manuel's comments and details about the batting orders.